Check your integration status on the Integrations page. Until Mailchimp actually receives data from PayPal, you will see that it's not connected and a red icon. There are a few reasons this may be the case. The PayPal account isn't a Premier or Business account. One of these account types is required to use the PayPal integration. No transactions have occurred since the integration was set up. The PayPal integration simply adds customers to your list once a purchase is made. So for your existing customers, you'll need to import them as you would any other list. The customers who buy from you in the future, however, will be added automatically via the integration. Someone made a purchase but wasn't added to my list. Purchases made through PayPal Express Checkout use a different system than traditional PayPal purchases. Because of this, we can't receive subscriber information or transactions via the integration when a customer makes a purchase through PayPal Express Checkout. If you receive the error message "Last message: Incomplete transaction received and ignored," this indicates that one of your PayPal customers placed a recurring order. Currently, this integration doesn't support recurring orders. Transactions are being processed through a shopping cart system. Log in to your PayPal Business or Premier account. 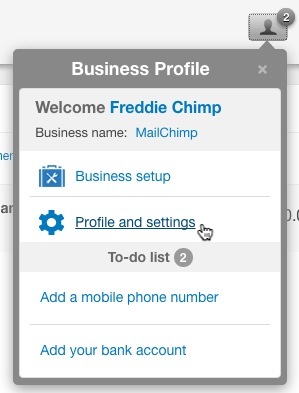 Click the Profile icon in the top-right corner and select Profile and settings. From the My Profile page, click My selling tools. Under the Getting paid and managing my risk heading, click Update next to Instant Payment Notifications. From the Instant Payment Notification page, click the link for your IPN History page. Click the message ID number for a specific transaction to see the details for that transaction. If the notification URL is not a Mailchimp URL, the information isn't being sent to Mailchimp but to another system. There was a problem with the information being sent to Mailchimp. Choose the transaction(s) by checking the box to the left of each transaction, and click the option to Resend Selected. If an integration connected to your Mailchimp account isn't working as expected, check the integration status from your Mailchimp account.